Plot: Two years after the events of Dawn of the Planet of the Apes, Caesar (Andy Serkis) and his tribe of apes have retreated to the Muir woods in the Pacific Northwest. Despite efforts to live peacefully away from mankind, Caesar’s life is torn asunder when his tribe is attacked by the Colonel (Woody Harrelson) and his faction of soldiers. When the attack results in a devastating personal loss, Caesar seeks revenge. Sending his tribe south to look for a new home, Caesar treks after the Colonel along with companions Maurice (Karin Konoval) and Rocket (Terry Notary). Along the way Caesar encounters Nova (Amiah Miller), a mute young girl whose affliction has serious ramifications for the future of the planet. 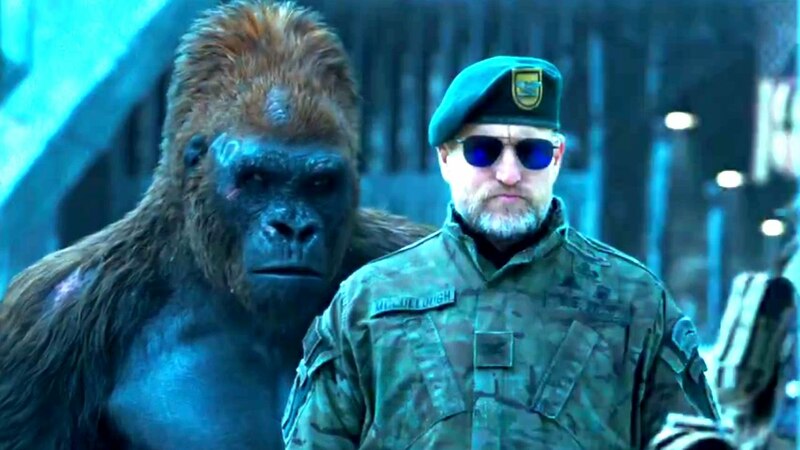 Review: It’s almost unheard of for the third film in a trilogy to be the best of the bunch, but with War for the Planet of the Apes, director Matt Reeves has made just that. Vast in scope both visually and thematically, War immerses the audience fully in the world of Caesar and his apes. Indeed, the majority of War involves the ape culture itself as the human story takes a backseat. It’s an evolution that began with Reeves’ Dawn of the Planet of the Apes three years ago and feels like a natural progression and logical conclusion to the series. I can’t overstate how amazing Matt Reeves’ direction is when it comes to War. Anyone who was worried about The Batman can rest at ease. After seeing War for the Planet of the Apes, trust me The Batman is in good hands. Every single shot possesses a meticulousness that is borderline Kubrickian. There are so many iconic shots in this film: the face-off between the Colonel and Caesar at the waterfall, Caesar riding along the beach, or the whipping of a fellow ape. What’s even more profound is how many of these shots contain little to no dialogue. Aside from one scene with too much exposition, the “show don’t tell” approach takes the forefront. Cinematographer Michael Seresin fully realizes Reeves’ vision. It’s some of the best mountain/landscape cinematography since Brokeback Mountain. I’d be shocked if Seresin doesn’t get nominated for an Oscar. As I stated the majority of War focuses on Caesar’s exploits and his followers. Mark Bomback’s script makes for a more personal and intimate film than the previous Ape installments. What’s poignant and intentional is that the apes have become more civilized than the humans. As Caesar says, “I did not start this war.” The apes are more concerned with living peaceful lives and caring for their families. The human faction, at least the Colonel and his acolytes, have descended into a xenophobic sub-culture, which the Colonel’s rhetoric generates and sustains. Indeed there are several scenes which demonstrate how enthralled the group has become; a jingoistic collective with one voice. This is probably why there are so few fleshed out human characters. This theme is exacerbated by the mutation of the Simian Flu, which now causes humans to lose their voices and devolve into more animalistic beings. In a world where xenophobia tends to be the norm it proves to be excellent social commentary. Woody Harrelson’s character is that social attitude personified. It’s no coincidence that he’s simply known as “The Colonel.” While he’s the leader of the militia, he’s faceless and primitive. This (to me at least) explains why we don’t get a lot of back story on why he’s so cruel and ruthless. Other than his son being killed by the mutated Simian Flu, there’s no real motivation for the Colonel to slaughter apes. In point of fact in a tension fueled confrontation with Caesar, the Colonel comments on how humans made the Simian Flu and hence the apes. Humans are complicit in their own downfall. Yet the Colonel chooses to be willfully myopic. It’s easier to blame “the Other,” if you want to use literary terminology, than it is to take personal responsibility. Some may consider Harrelson’s Colonel to lack depth but I think that’s the point of screenwriter Mark Bomback’s character. The real star of the show is, once again, Andy Serkis. His iconic portrayal of Caesar throughout the Apes trilogy ranks up there with Harrison Ford as Indiana Jones, Mark Hamill as Luke Skywalker, and Clint Eastwood as William Munny. The Apes trilogy is in a very real sense all about Caesar’s story arc throughout the three films and his evolution as a sentient being. With War Serkis proves once again that he’s one of the finest working actors today, motion capture or no. Whereas Dawn focused more on Caesar’s emergence as a leader, War addresses the pressure of that leadership and the toll it takes upon him. Caesar gets caught up in a very real human fallacy: the quest for revenge. For the first time we see Caesar’s own personal agenda supersede his responsibilities to his people. On an individual level Caesar fights an internal war for his own soul. He agonizes over having to kill Koba from the last film, while fearing he may become like Koba. It’s a true tour de force of acting that packs a huge emotional wallop. Serkis’ performance is nothing less than spectacular and deserves an Oscar nomination, motion capture bias be damned. Furthermore, I can’t imagine a universe where War isn’t nominated for Best Visual Effects. It is astonishing, how far visually the apes have come even from Rise of the Planet of the Apes which debuted only seven years ago. I say this with no hyperbole, the apes look real, as in like they are real entities in the world that exist. Once again Michael Giacchino raises the bar when it comes to movie scores. His second this year (first being Spider-Man: Homecoming), War‘s score is also worthy of Oscar consideration. It ranges the gamut from haunting, to suspenseful, to touching. William Hoy’s editing and Seresin’s cinematography meshes well with Giacchino’s score to create something more than just a movie, but an experience. 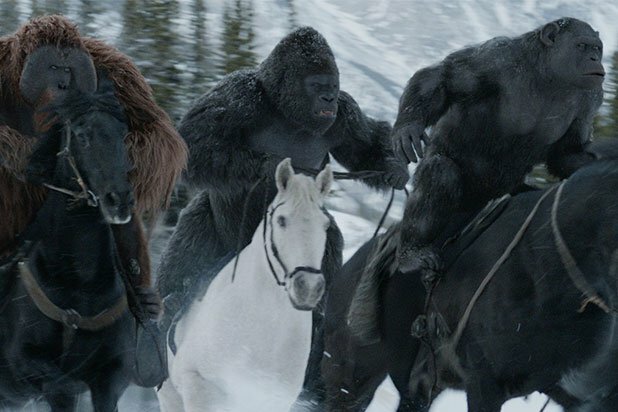 Aside from Logan, War for the Planet of the Apes easily ranks as the best film I’ve seen this year. It’s a film that will stay with me for a while and is unquestionably the best conclusion to a trilogy ever put on screen. Don’t miss it.